One of the signature projects of Limassol beachfront road is reaching its final stage of completion with the construction actively progressing. 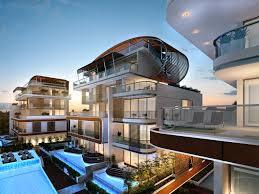 The given project is the newest and one of the most thought after residential tower projects of Limassol. It is formed of two towers — A and B, reaching skyward to 82m and 70m respectively and offering spectacular views of the sea and town. The concept behind this luxury apartment blocks is creation of a residential complex with extensive upmarket services and facilities while offering its residents uninterrupted sea views from all apartments. The towers feature beautiful glazed entrance lobbies, and are joined by 17.5m high atrium with two glass lifts. The development is a bright example of a modern luxury and shows an optimal use of height, glass and decorative facade materials that make a striking impact. Separate spacious apartments are all built to the highest standards enjoying privacy, autonomy, none of them having common walls, while 12 apartments feature private roof garden and the rest nice panoramic verandas. The finishes and fittings are in light colors and minimalistic modern luxury style. Each apartment has two parking spaces, one covered and one uncovered and a storage room. Additionally, the residents can take advantage of a wide range of facilities, including the use of meeting rooms, gyms, olympic size swimming pool and a 24/7 concierge services, starting with laundry services and ending up with apartment breakfast and food services. If you would like to know more about this development and the opportunity of acquiring Cypriot citizenship when purchasing a home in Cyprus, please contact ReLux Estates property specialists and we would be happy to provide all information.